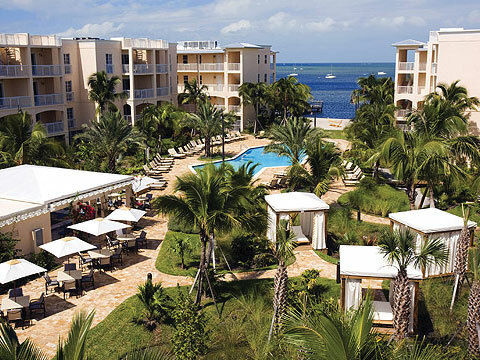 The pride of Key West Beachside Resort & Conference Center is a seven-acre waterfront property with lush tropical gardens, magnificent waterfront swimming pool, and a wide variety of unique dining experiences. It is a blend of island ambiance and contemporary elegance, set on the southernmost point of one of the worldâ€™s most storied travel destinations. Here, the laid-back island lifestyle of Key West is complemented by luxurious resort services and amenities. And here the sun never sets on hospitality. From the moment of your arrival you will see that the service provided by our staff of seasoned professionals is reminiscent of another age. You will find that each member of our staff takes a personal interest in your individual satisfaction. For here at Beachside, you are never merely a room number. You are, in fact, an honored guest. AMENITIES Southern comfort, well served. Beachside offers the ultimate luxury resort experience to the most discriminating visitors of legendary Key West. Around every corner awaits a unique experience in gracious living and contemporary sophistication. â€¢ 24 hour concierge, valet parking, bell services and personalized guest services â€¢ Cool, sandy private tanning beach â€¢ Full-size swimming pool with private cabanas available and our poolside Blue Bar, a casual dining oasis â€¢ Spa services may be arranged including a variety of specialized beauty treatments and renewing massage â€¢ Complimentary high-speed Internet in all rooms â€¢ Complimentary downtown shuttle â€¢ Just minutes from everything Key West has to offer â€¢ Tavern N Town Restaurant - Key West's premier culinary destination â€¢ Tapas dining bar with two theater kitchen views and a private dining room for up to sixteen guests â€¢ Complete business center, professional meeting planners â€¢ Conference, meeting and banquet facilities â€¢ Ideal venue for weddings and social events â€¢ Well equipped fitness center with water's edge view â€¢ Rooftop helicopter landing pad WEDDINGS Grand surroundings, spectacular views, the finest cuisine. Beachside Resort & Conference Center offers countless custom options to make your ceremony and reception a totally unique experience for you and your guests. Grand surroundings, spectacular views, fine cuisine, and exceptional service combine to create the ultimate memories for your special day. Wedding packages range from intimate to elegant. And no matter how large or small your guest list, there will be no question as to the memory you will create for them. ACCOMMODATIONS One Bedroom Standard King Every room at Beachside is an experience in luxury living not to be soon forgotten. Your accommodations will be second to none on the island of Key West. Every room includes the following amenities: â€¢ Luxury Frette linen bed coverings â€¢ Bath items by Lâ€™Occitaine â€¢ LCD flat panel televisions â€¢ Complimentary hard wired Internet â€¢ Complimentary local and long distance calling ABOUT KEY WEST A world away, and yet so close you can taste it. Few destinations in the world have the allure of this legendary island. You just have to say the words, â€œKey Westâ€ and you see faces light up all around you. Not because of its geographical significance as the southernmost point in the United States. But because of the unique individuals who have each lent their character to the collective character of this one-of-a-kind vacation destination. Which is why so many people who have come to visit over the last 100 plus years, have decided never to leave. Key West truly has something for everyone; and it goes from morning, to nightâ€¦right into the next morning for many of its visitors. Yes, the nightlife here is famous for bringing out the island fever of even the most bashful wall flower. And it all begins as the day ends, when the whole island seems to gather for a nightly Sunset Celebration on the Mallory Dock. Once the musicians, mimes, artists and jugglers take their last bow, its time for locals and visitors alike to find their way into favorite sidewalk cafes, open-air bars, world-famous pubs and world-class restaurants. Still others take to the theaters to enjoy the drama, musicals and comedy that flourish on the stages of the ever-vibrant Key West. No matter what your nightly pleasure, one thing is almost certain. Another glorious Key West day is right around the corner. Spend it offshore on one of the islands many fishing guide boats or private charters. Golf at nearby Key West Golf Club, a course beautifully designed by Rees Jones. Marvel at the fabled treasure of the galleon Atocha. Pay a visit to the historic Bahama Village neighborhood. Patronize the arts at dozens of galleries exhibiting the work of the islandâ€™s prolific talent. Or simply walk in the footsteps of Thomas Edison, Harry Truman, and Tennessee Williams as you stroll the palm-lined streets lined with gingerbread mansions and tin-roofed conch houses. However you choose to see the town, you'll discover that old town Key West is one of America's true architectural and botanical treasures. On even the tiniest lanes, the locals have faithfully restored old wooden homes and adorned them with lush tropical trees and flowers. Tomorrowâ€™s Key West Our Commitment to Preserving the Natural Wonder of the Keys The precious natural resources which make up the delicate ecosystem of the Florida Keys are constantly threatened. At Beachside, we continue to adopt as many â€œgreenâ€ practices as possible in order to preserve this natural wonder.